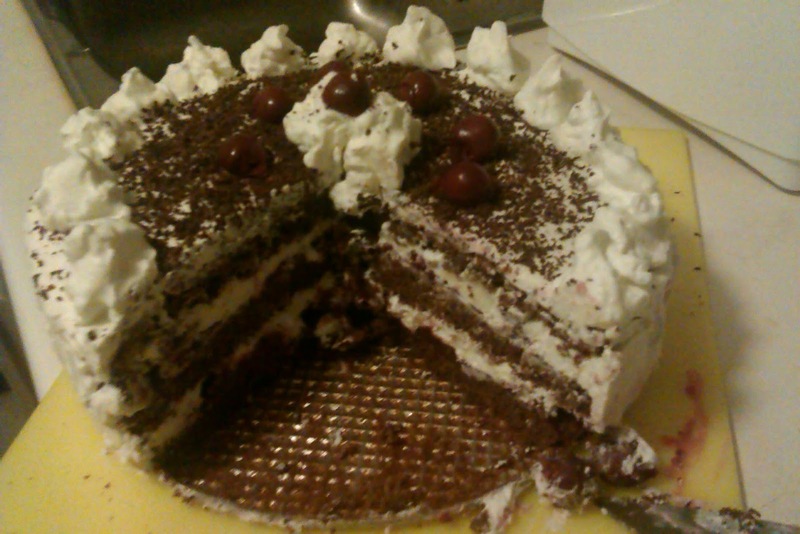 I made this lovely gateau today. This cake is so much better than anything that is sold under the same name here in Canada. Melt chocolate and butter together by placing them into a bowl, over a pot of boiling water, stirring regularly. In a separate bowl, beat egg yolks while adding sugar gradually to make fluffy mixture. Mix and beat chocolate mixture to the egg yolk and sugar mixture. In a third bowl, mix flour, starch and baking powder. Put half the amount of flour mixture in with the chocolate mix and beat on lowest setting. Carefully, with a spoon, add 1/3 off the egg white snow to the flour /chocolate mix. Carefully, with a spoon, mix and fold the remaining flour, then add the remaining egg white snow mix, gently fold as well. Fill into a cake pan and place into pre heated oven at 350°F (175°C). After complete cool down, cut cake in 3 separate layers, using string. Make sure to save some cherries for decoration! Mix the corn starch with the sugar in a small bowl, add 3 tbl of the cherry juice. The mixture shoulder a thick texture, remove from heat, add cherries. Add 50ml of the 100ml of rum. Use remaining rum to sprinkle over the two bottom cake layers. Using tin foil, make a ring around thebottom layer of cake. Make sure it's higher than the cake pan. Place the cake ring back on. In a big bowl, whip up thecream with the stabilizer, the sugar and the vanilla extract. Take 1/4 of the cream and place evenly on the cherry layer. Now, add middle layer of cake on top of cream layer. Now add rest of cherry mixture on top of that middle layer. Place another 1/4 of the cream on top of cherries. Place top layer of cake. Sprinkle any kind of shaved chocolate on top of cream. Now, decorate with rest of cream, little blobs around around three cake and in the middle. 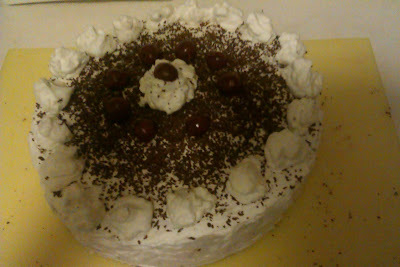 Also decorate with remaining cherries. Also, if there is any cream left over. Spread around the sides of the cake.